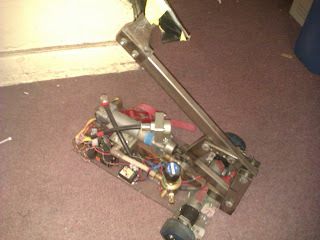 I’ve had a look at what’s left of our various fighting robots. In the featherweight class there are only two real possible salvage options. First up is Meathammer, a steel frame 4 wheel drive, 4 motor push bot. It broke a couple of gearboxes at Burgess Hill fight, probably in 2007? The tricky bit is working out where I left off with the repairs, and where the parts might be. 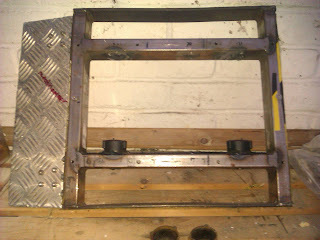 So at lunchtime I took the frame outside to saw off the problematic gear cages. I put the batteries on the old supernova, and they seem to be hold charge, the speed controllers and wiring seem to be ok, and the armour is fine. The other option is the axe robot, which has never really been finished. It had its first outing at the Norwich Eureka event in 2003? as an electric axe, but since then has been converted to gas, electric and back to gas again…. I’ll try and dig out the Killercarrot chassis when it stops raining.